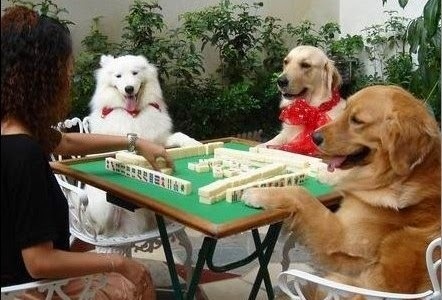 Is your game going to the dogs? I recently received an e-mail from a frustrated player. Her complaint? Even though she played with experienced players, they hardly ever finished a game in under an hour. Why? Distraction, distraction, distraction. She asked for advice, rules of etiquette - how much "social" and how much "playing"; how to focus the game without being an object of derision. She was not talking about pace. Sometimes it is clear that there is one player who just plays slowly to the detriment of the other players. No matter how many times you tell her to play a little faster, she can't. It is out of her control and eventually she is not invited back. But there is a more insidious game-buster out there, and its name is distraction. You're hot and heavy into the game, maybe you are set, you are checking to see if your tiles are out when suddenly "Tara's Theme" from Gone With The Wind starts playing loudly seemingly out of nowhere. "That's my daughter," says player A, as she whips her cell phone out of her bra. "Hi, honey," she says, while you wait for her to pick a tile. "Did you make the meat loaf the way I told you?" She then proceeds to talk for several minutes, oblivious to the other players glaring. Eventually player B gets up to get some chocolate covered almonds. Player C says, "Might as well go to the bathroom," and you, player D, silently fume. By the time the game resumes no one remembers whose turn it was and your great hand has gone down the drain. When I was in high school I was astonished to learn (bear with me, this is relevant) that there were people who studied with the radio on. How could they? I cannot concentrate on my Kindle if I hear the slightest bit of music leaking from someone's headphones on the subway. People differ and, like anything else in life, if an experience is going to be shared to everyone's satisfaction, differences must be respected and boundaries set. Much like the decision whether to play 13 tiles no hot wall or pay double when you throw double, deciding when to socialize and when to play should be a rule that is agreed upon by all. Our weekly game normally is 10 people, and it's not as if we don't like to talk. But over time our chatting has ceased during the game and is reserved for times when no one's concentration will be disrupted. We chat before we start playing; when the tiles are being mixed, after a game ends. We take a dinner break and talk to our heart's content. We don't turn our phones off (which makes for interesting background noise) but we return calls when we are out and take care of other business. When the game is going on no one would think about discussing the Oscars or taking out pictures of the grandkids. (Although I do admit to wanting to do this, I wait until the game is over). It's not hard to do, but the key is getting everyone to make the effort until it becomes second nature. I mean, after all, if you are yapping away, you are probably making terrible passes, throwing your own tiles and having no clue what people are set for. This makes the game unchallenging for someone who really wants to play. Did you really just pass two soaps and a 2 dot? Why are you playing at all? This is not to say there needs to be mahjongg police. A few kvetches about your impossible hand or an exhortation to the joker fairy are of course exempt. It is the irrelevant, extraneous non-mahj related chit-chat of which I speak, the kind that starts in the space between when a player picks and takes a moment to decide what to discard, the kind that throws the game off track. So to my e-mailer, who shall remain anonymous, I feel your pain. It is excruciating to try and play while others are busy doing other things. You are essentially playing by yourself. All you can do is ask them to try to refrain, and hope they have enough respect for you and for the Game of Mahjongg to do so. Otherwise, your game has gone to the dogs, and your only option is to find another game and socialize with these ladies in another context.